In this week’s episode of “YOUR QUESTIONS ANSWERED“ I want to answer the succeeding questions from one of my clients Roman as part of my 1:1 consulting and advocacy service! Patrik: Right. So, you can see that ejection fraction basically means pump function, okay? So, an ejection fraction of 30% is too low. A healthy heart should be between 50% to 75%, right? And now you’re telling me it’s 20%, you obviously need to verify that, right? Need to verify that. And you need to ask why has it gone down and not gone up? Patrik: Right? I’ll tell you one of the risks during bypass surgery: one of the risks during bypass surgery is to potentially sustain another heart attack, I have seen it, because it’s high risk surgery. Yes, it’s surgery that’s being done every day, all over the world probably thousands of times, but it’s still fairly high risk surgery. So, you may want to ask them whether he’s sustained another heart attack, which could be one of the reasons why his ejection fraction might have gone down to 20%. Now, one of the ways to find out if he had another heart attack is to ask for a troponin level, I’ll type that in. Patrik: Yeah. That’s a blood result that will indicate a heart attack. I’ll type that. Troponin level in blood will indicate heart attack. The other thing they need to look for is: he would have had a 12 lead ECG do you know what I mean by that? Patrik: Do you know what an ECG is? Roman: What does it mean? Susie: It’s the exam that they do for the heart … I can’t explain it in English. But I know what it is. It’s an exam. Patrik: It’s a snapshot of the heart. It’s basically like they put cables onto the chest. Susie: I was telling him in English. Roman: It’s called, like a nickname in Spanish, electro, as simple as that. Patrik: Yeah, that’s what it is. So, that would give you an indicator whether he’s had a heart attack or not, okay? HOW LONG CAN MY CRITICALLY ILL LOVED ONE STAY ON AN INTRA-AORTIC BALLOON PUMP (IABP) IN INTENSIVE CARE? HOW LONG DOES A CRITICALLY ILL PATIENT STAY ON A VENTILATOR AFTER OPEN HEART SURGERY? Patrik: And then, coming to … you mentioned the blood, and I think that’s important for you to understand as well. So, when patients have bypass surgery, they go on a bypass machine, and the bypass machine is taking over the function of the heart during surgery. Now, during this surgery patients are losing a lot of blood, right? Sometimes patients don’t need blood transfusions, but in many situations they do, okay? And the doctor is right if he says, “Yes, by giving a blood transfusion it helps with oxygenation.” I totally agree with that. And the reason for that is when patients bleed, their haemoglobin drops. Haemoglobin is the red blood cells, okay? And the red blood cells transport oxygen through the body. So, when patients bleed and they lose haemoglobin, there are less transport mechanisms for the oxygen, are you following? Patrik: Okay. So, from that aspect, your dad needs to have the red blood cells replaced to transport oxygen around the body. Now, here is why this is important, okay? And one of the next, besides everything we’ve talked about so far, the next challenge is your dad needs to come off the ventilator, and your dad needs to start breathing by himself. Now, one of the ways to wean somebody off the ventilator is by having enough oxygen supply through the body, and that’s why he needs the blood transfusions, but hopefully he won’t need any going forward. He might have had one or two, and hopefully that’s enough for the whole episode. How Long Can A Critically Ill Patient Stay On Life Support? Here is the next thing: do you know whether he’s got any chest drains? Roman: Chest what? I’m sorry. Patrik: Yeah. So, after cardiac surgery, they leave drains in the chest. Roman: Yes, he has that. Patrik: Okay. Please ask them if he’s still bleeding from them. Patrik: So, here is why that it’s important: so, after surgery the risk for bleeding is fairly high, and if there were no chest drains, let’s just say patients would come back without chest drains and there was any bleeding, patients could have another heart attack because the blood couldn’t go anywhere. So, the chest drains are really there to drain bleeding in case there is bleeding, and that would … And, number one, you could see that there is bleeding and, number two, the heart wouldn’t get compressed. Roman: I think he has those things. Susie: He has. And I think I saw that they’re draining, and there is still some blood yesterday. Patrik: Okay. And that’s a concern because after three days they should be out. Patrik: Okay? And the reason they’re probably not out yet is because he’s probably bleeding. What Are The Side Effects Of An Induced Coma? 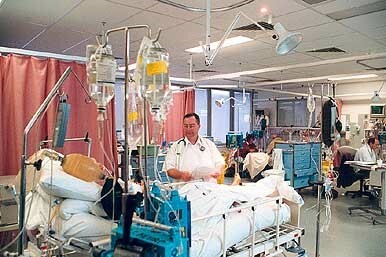 WHAT ARE THE CHANCES OF SURVIVAL FOR A PERSON IN AN INDUCED COMA? Roman: We should see today, right? Roman: Yes, if he’s still bleeding? Okay. So, here is the next thing that’s important for you to understand: during surgery, he’s on the bypass machine, okay? The bypass machine is taking over the function of the heart, but also the function of the lungs, okay? Both. So, basically, anybody who’s having bypass surgery is being kept alive with the bypass machine, because the heart they operate on, the heart is not beating during surgery, okay? They restart the heart after surgery. They can do that, I’ve seen it, okay? But why is this important? So, neither the heart nor the lungs are working throughout the surgery, the lungs in fact are collapsed, okay? So, after surgery, when they restart the heart they also inflate the lungs again, but the lungs have been collapsed for a few hours, right? You mentioned earlier five or six hours of surgery? Patrik: Right. So, the lungs have been collapsed for five or six hours. Now, that increases the risk for pneumonia. Patrik: Okay? Now, it doesn’t mean that patients end up with a pneumonia, but it significantly increases the risk for it. Patrik: Okay? So, that’s why, number one, he needs to get out of the coma as quickly as possible, because there’s the risk for pneumonia, he needs to start with some physical therapy, ideally he needs to get off that ventilator to minimize the risk for pneumonia, and all of that, right? But it’s important for you to understand that the lungs have been collapsed for a significant period of time, and that the risk for pneumonia is significant. It’s also important for you to understand that the risk for kidney failure is significant, it doesn’t mean it’s going to happen but it can happen, okay? My 47 Year Old Sister Is In ICU With Pneumonia And The Intensive Care Team Wants To “Pull The Plug”! Help! Patrik: So, then the next thing you need to ask are … three really important questions: number one, what is their plan in weaning the balloon pump and weaning the inotropes? The inotropes, again, that’s the medication for his blood pressure, for his low blood pressure. That’s a really important question, okay? Then the next question is: how are they planning to wean your dad off the ventilator, right? And then, if they can’t wean the balloon if they can’t wean the inotropes, what’s their plan? What’s their outlook? The doctors that you’re talking to, are they intensive care doctors? Are they cardiac surgeons? Are they cardiologists? Do you know who you’re dealing with? Roman: Yes. We can find the surgeon and the cardiologist, but also we have the chance to talk with an intensive care doctor. Susie: Yes. The surgeons go every day to check on him, and we have seen them and we have talked to them. But with the intensive care doctors, it’s usually the residents who interact with the families. Patrik: Yeah. And that’s what you meant earlier, Roman, you were talking to junior doctors. Patrik: Well, ask them why not? Ask them what do they have to hide? So, what they are trying is … I think, of course, their objective is for him to have enough, I guess, that his heart can beat better, I guess, right? Patrik: No. The reality is like … Okay, I’ll tell you the outlook that I can see, okay? Hopefully your dad can come off the balloon pump and the inotropes, hopefully. I can tell you that if he’s ejection fraction is 20%, I believe they will have a hard time weaning the balloon and weaning the inotropes, right? Patrik: But then, on the other hand, as I said to you, I have seen the balloon pump left in a patient, I’ve seen it up to three weeks. Again, that’s not ideal, but if it saves lives then you have to look at, “Okay, what’s more important? The infection risk or saving the life of a patient and managing the infection risk?” Right? You’ve got to weigh that up. Sometimes the heart needs time to recover, okay? But I think your next, or one of your next most important steps is to find out why can’t they wean the balloon pump? Why has his ejection fraction potentially gone down? Roman: Yes, that’s a very important question. It shouldn’t, right? Patrik: That is a very important question. Roman: Because it should have gone up in fact, right? After surgery. Patrik: Yeah. So, there are a number of things. As I said, the risk of sustaining another heart attack during surgery is there. I couldn’t tell you whether the risk is 20%, or 10%, or even 50%. I couldn’t tell you the likelihood, but I have certainly seen it, right? So that’s why you’ve got to ask. So, why can it happen? Also, I still believe that he should have had surgery fairly quickly after the heart attack to open up the blocked areas. That’s what I … but we can’t turn back what happened. But it’s definitely you need to find out why can’t they wean him off the balloon pump? And what’s their plan if they can’t wean him off the balloon pump? You see, I tell you what should happen, that’s important to understand as well. In the ideal world, they should take out the balloon and not need inotropes. If they’re weaning down the balloon and they have to increase the inotropes, it’s a clear sign that his heart is not coping. My Son’s Father Had A Heart Attack And Is Not Waking Up In Intensive Care After Cooling Therapy! Please Help! Roman: Because they have weaned down the balloon. It seems to be off, or even out. I think it’s off, actually. But he has this medication to keep his blood pressure. Roman: It seems to be a high dose. Patrik: Yeah, I think so. I think it is. With an ejection fraction of 20%, it would most likely be a high dose. Patrik: Okay. Has that been helpful so far? Has that been helpful so far? Roman: Yes. So, what would … I mean, with that clinical scenario, what could … I mean, what are things that can happen next? If it didn’t do well, how would we see that? Whether there are any chances of things getting better, or he doesn’t have any chance. Patrik: Oh yeah, there’s definitely chances of getting better. So, if your dad is not getting better in the next few days he will stay in an induced coma, okay? They won’t wake him up if he’s not getting more stable. So, a lot of it will depend on whether the heart is recovering or not. A lot of it will depend on that. And sometimes, the other thing that’s important to understand, you know, it must be horrifying for you to see that because I’ve seen it so many times, right? Sometimes all it is, it is time, right? And you, as a family member, you stand next to the bedside and you see your dad suffering, and you think, “Oh my goodness, how can we speed this up?” Sometimes the only way to speed it up is to give your dad time. Patrik: Right? And I know it’s not nice to watch, he can’t talk, he’s in a coma, he can’t respond to you, you are very … you don’t know what’s going to happen, and sometimes that’s what it is, you’ve just got to give him time and you give it time to heal. But I think for now, this is … run with that, ask those questions, and then get back to me, and then we could do another half an hour. I think that’s … There’s no point in looking too far into the future. I think get some answers to those issues, and then we can probably look into the future. Roman: Okay. Thank you so much. Susie: .. They have sort of answer, but he’s very cold, maybe too much with it. They keep him in a lower temperature, that’s correct, right? Susie: Well, that’s what he said, that it’s normal that he’s very cold. He’s kind of freezing, I don’t know why it’s that way. Patrik: No, he shouldn’t be cold. One of the reasons he would be cold is, again, because his heart is not pumping at the best, and because of that, he would potentially be cold. But then what they need to do is they need to warm him. Susie: Okay. Because they said it’s normal and we’re trying to avoid a fever, which he has had a fever yesterday, he had, I believe, a fever. Susie: But to me it’s kind of frightening to touch him and he’s so cold. Patrik: He’s so cold. That could be from the heart not perfusing the whole body that could be one of the reasons. But simple sort of one and one nursing really is make sure your patients are warm, they’re covered. Susie: He’s covered but with a very thin sheet. But when you touch him he’s extremely cold. Patrik: You see, the reality is if he has a fever, if he … God forbid, if he gets a fever, there could be that he might have an infection, right? So, if that’s the case, they won’t be able to keep him cool anyway, right? But again, don’t worry too much about that if he doesn’t have it. Yes, it’s probably better if he’s a little bit cooler than having a fever, I agree with that. I’d rather he’s on the cooler side than on the warmer side, I agree with that. But I wouldn’t worry too much about that at the moment because it doesn’t seem to be … You know, if he had a fever, 38, 39, I would be extremely worried. But if that’s not the case, if he’s a little bit cooler, that’s not necessarily a bad thing. Susie: … control it and take it down. But they said he’s on antibiotics and they were going to make a new test to see if he needs another antibiotic. So, look, I think focus on that for now, focus on the life support, focus on how can they get it off, what’s their plan, how can they get him out of the coma? Can they remove the chest drains? Ask whether he’s had a heart attack. Patrik: Okay? And get those answers, and then we could probably … then it’s much easier to look into the future. Susie: Okay, perfect. Thank you so much, Patrik. Roman: Thank you so much. And we’ll be reaching out tomorrow. Roman: … your time, your insight and your kindness. Patrik: You’re very welcome. It’s been a pleasure. Susie: Thank you so much. Patrik: You’re very welcome. I’ll talk to you tomorrow. Take care. Patrik: Yeah, just message me. Patrik: You’re very welcome. All the best for now. Roman: Thank you. Thank you so much. Bye. Is it best for my Dad to go from ICU to step-down or should he be going to Rehabilitation straight away? PODCAST: The Doctors asked us to stop treatment, but I gave my father in ICU a chance instead! The ICU team is not following the policy regarding the treatment protocols for my mother. How can I respond to this? What are the chances of survival after a tracheostomy? I don’t think the ICU wants to help my mother to fully recover and get off the ventilator. How can I find out?